Are you coming to Sardinia and would you like to have a Kitesurf Personal Trainer – Instructor to learn kitesurfing or improve your kite level? Are you looking for a Kite Personal Guide that bring you always to the best windy kite spots of Sardinia by showing you all the kite spot secrets? Do you like to have a Kite Personal Trainer – Instructor that come as close as possible to your beach? If so, hire one of our Kitesurf Personal Trainer – Instructor – Guide! Kite Personal Trainer-Instructor-Guide: what is it? In general, a personal trainer (PT) is a professional figure responsible for managing in an individualized way the physical exercise of people who approach to or practice physical activity. Our Kitesurf Personal Trainer-Instructor-Guide is an expert and professional instructor that can be, Kite Personal Trainer-Instructor and even Kite Guide. Kite Personal Trainer-Instructor-Guide: When to hire him? Let us go to the point: why and when should we choose a Kite Personal Trainer-Instructor and Guide? Group of People with different kite levels: if you are a group of people with different levels, our Kite Personal Instructor-Guide will bring you to the best windy kite spot every day, showing you the secrets and characteristics of the kite spot, giving kite lessons and advices to the part of the group that would need. The Personal Trainer-Instructor will be at your disposal for the time that he is with you. Kiter with Family: are you a kiter in Sardinia with your family? Do you like to kitesurf and the rest of your family doesn’t? 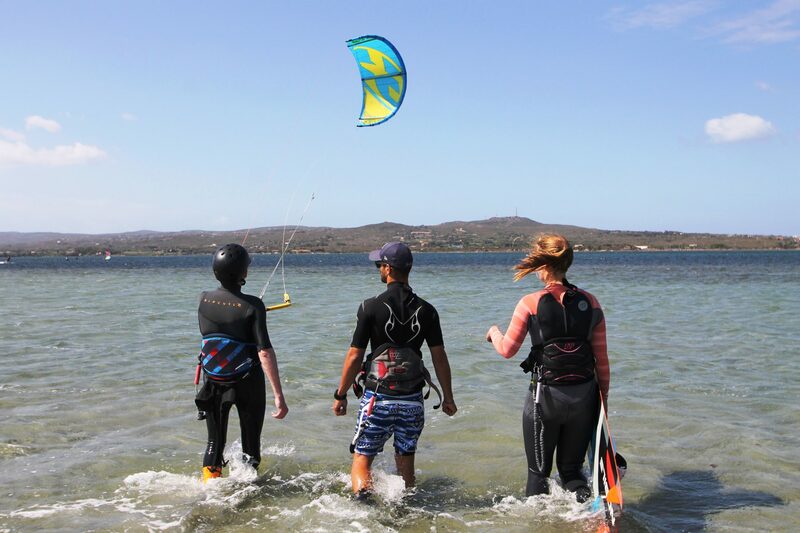 Hire a kite instructor to move to beaches that fit both needs: kitesurf and relax. Looking for a Kite Safari: If you are a rider and you like to discover enjoy all the best kite spots of Sardinia (kite spots for beginner or advances or both) with a Local Expert Kite Guide. Being Sardinia a very windy island, a new kite spot from the east, to the south and to the west of the island, can be reached almost every day! Follow the wind, discover new kite spots, hire one of our Kite Personal Guide! Kitesurf close to your location in Sardinia: thinking about to learn to kitesurf or improve your kite level as close as possible to your location in Sardinia? Our Kite Personal Trainer – Instructor – Guide will move to the Kite Spot closest to your location. Targeted Objectives: when you want to customize your training / kite session compared to a standard course and in respect to the results you like to achieve (water start, body drag, jumps, ride a strapless surf-board, tricks, etc). Whatever is your kite level, beginner, intermediate or advanced, our Kite Personal Trainer-Instructor will take you to the next kite step in the most professional and safest way. Time Difficulty: for reasons of work / family, to optimize the time available, sometimes taking time is really hard. With a Kite Personal Trainer-Instructor you can plan your schedule (always in agreement with the trainer-instructor after checking the weather forecast) and speed up the results too. Motivation: A personal trainer is also a coach that does not make you feel the weight of fatigue, it gives you the right motivation. Lifestyle: Being also a coach, the Kite Personal Trainer fit the training program with respect to your lifestyle, providing you even advice on nutrition. Our Kite Personal Trainer – Instructor – Guide could do all the above and even more! Hire one of our Kite Personal Traoners – Instructors – Guide. 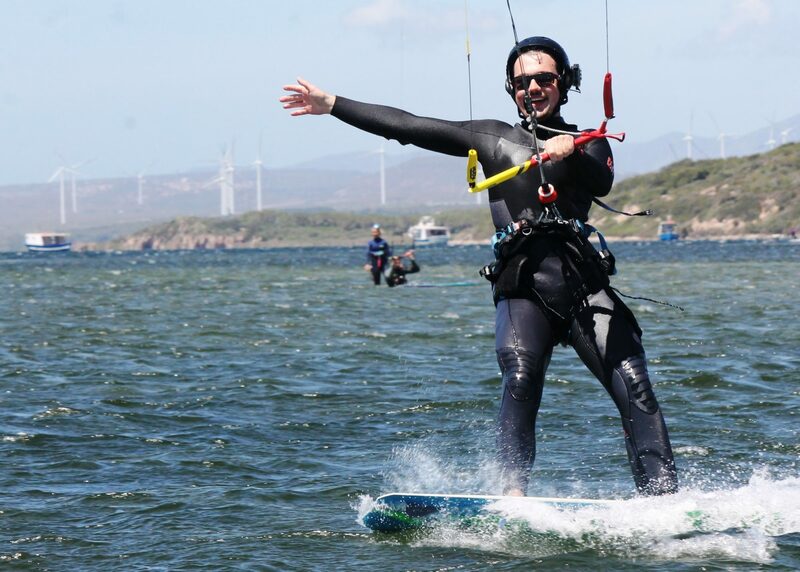 Enjoy kitesurfing having fun with the best professional way! How many people can be managed by the Kite Personal Trainer – Instructor – Guide? People that can be handled by one of our Kite Personal Trainer – Instructor – Guide depends on the level of the kiters. Advanced riders (everybody can go upwind): 8 riders can be managed. Does the hiring of one of our Kite Personal Trainer – Instructor – Guide include even the kite equipment? The Kite Personal Trainer – Instructor – Guide has the equipment to follow a group of beginners / Intermediate of max 3 people with one kite (for safety reasons, the Kite trainer – Instructor – Guide cannot have more than one kite dedicate to beginners / intermediate). What is included in the hiring of a Kite Personal Trainer – Instructor – Guide? Video recordings made during the day. Prices of Kitesurf Personal Trainer – Instructor – Guide hiring. Additional equipment: if you need additional equipment, you can rent it. How Can I hire a KIte Trainer – Instructor – Guide? Would like to hire KIte Trainer – Instructor – Guide in Sardinia with us? In this case you should follow the instructions at the kite Courses/Camps registration page, by clicking here.